When Ann Harper’s (Loretta Young) grandmother passes away, the family gathers for the reading of the will. Ann’s grandmother was a very wealthy woman, so Ann’s family members are all eager to find out what she’s left to them. Much to everyone’s surprise, most of the estate is left to Ann, but there are strings attached — she will not receive her inheritance until she gets married to a man approved by her repressed aunts Katherine (Ethel Wales) and Sarah (Louise Fazenda). Not only that, the only way anybody in the family will get their inheritance is if Ann gets married without being involved in any scandals that make the newspaper. Ann has no desire to get married and resents being forced into it, so she needs to get involved in a scandal and fast. She puts an ad in the paper looking for a young, attractive, unscrupulous man and when Gil Hayden (Douglas Fairbanks, Jr.) sees it and decides he’s the man for the job. He shows up at Ann’s apartment to find Ann and her eager maid ready to set up the big scandal. But while they’re waiting for the newspaper reporters to arrive, Ann’s aunts come over and try to force Gil into marrying Ann, so Gil jumps out of the window. However, during their brief time together, Gil and Ann start to fall in love with each other. When Gil goes home and tells his roommate about his meeting with Ann, Gil’s roommate decides Gil needs to marry Ann for her money. One night when Ann is out at a new nightclub, her aunts go to keep an eye on her. Gil and his roommates are also there. Gil’s roommates ply Ann’s aunts with alcohol, leaving Gil to spend time with Ann. But when the club is raided, it turns out Ann’s aunts are the ones most likely to make the scandal sheets. The only way Ann will save their reputations is if they allow her to marry Gil. 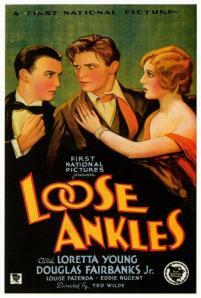 Loose Ankles‘ plot is flimsier than a piece of paper, the acting isn’t good, and at 70 minutes, it still manages to drag on for too long. But if you’re just in it for the pre-code factor, you might have a little fun with it for that reason alone. It’s certainly not a great movie, but if you want pre-code material, it at least delivers on that.